3D wire models of hand motion paths (or chronocyclegraphs) created by Frank Gilbreth, a pioneer in the study of motion in the workplace. 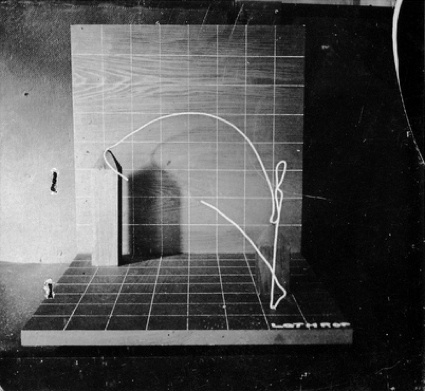 In his 1917 book, Gilbreth explains how he created these solid models from time-lapse photographs, and how useful they are to study and teach human motion. First photograph of wire models showing one man's progress of learning paths of least waste. These wires represent the paths of the left hand of a manager on a drill press, – a machine which he had not touched for twenty-five years. Régine Debatty (2012) The Chronocyclegraph. Everardo Reyes-Garcia (2014) Explorations in Media Visualization. Frank Bunker Gilbreth (1917) Applied motion study; a collection of papers on the efficient method to industrial preparedness. Left image from Régine Debatty, right image from archive.org.